Mr. Aubrey Calhoun of Greensburg, Kentucky, son of the late Warner Morrison Calhoun and Flossie Mae Walker Calhoun, was born on Sunday, March 17, 1935 in Green County and departed this life on Tuesday, April 10, 2018 at the Green Hill Rehab and Care Center. He was 83 years and 24 days of age. He had made a profession of faith in Christ and was a member of the Allendale Missionary Baptist Church. He was also retired from Kentucky Trailer Manufacturing. Survivors include four sons and daughters-in-law: Gary and Tammi Calhoun, Charlie and Pam Calhoun, Tommy and Dina Calhoun, and Mike and Tammy Calhoun all of Green County; a daughter and son-in-law: Rebecca and Daniel York of Greensburg; 12 grandchildren; 15 great-grandchildren; and a host of other relatives and friends. Mr. Calhoun was also preceded in death by three brothers and three sisters: Vechell Calhoun, Rollin Calhoun, Carnell Calhoun, David Calhoun, Willie Shope, and Wilkie Lewis; and his ex-wife: Judith Ann Latham Calhoun on March 10, 2001. 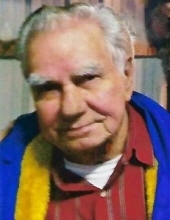 The funeral services for Mr. Aubrey Calhoun will be conducted at 10:00 A.M., Central Time, Friday, April 13, 2018 at the Cowherd and Parrott Funeral Home with burial to follow in the Akin Family Cemetery. Bro. Dale Warren and Bro. Roger Gilbert officiating. To plant a tree in memory of Aubrey Calhoun, please visit our Tribute Store. "Email Address" would like to share the life celebration of Aubrey Calhoun. Click on the "link" to go to share a favorite memory or leave a condolence message for the family.